The St James Walkway is about 66km long and takes five days. It is graded as an easy tramping track but extreme weather conditions can occur in any season. The track passes through subalpine vegetation, a variety of forest types, and the open grasslands of the St James Station. Trampers need to be self-sufficient. The road over the Lewis Pass is on the western edge of the map. Part of the St James Cycle Trail is along the eastern edge. The combination of contours and relief shading, gives a realistic landform. The map covers a large part of the St James Conservation Area. The Te Araroa Trail passes diagonally across the map. 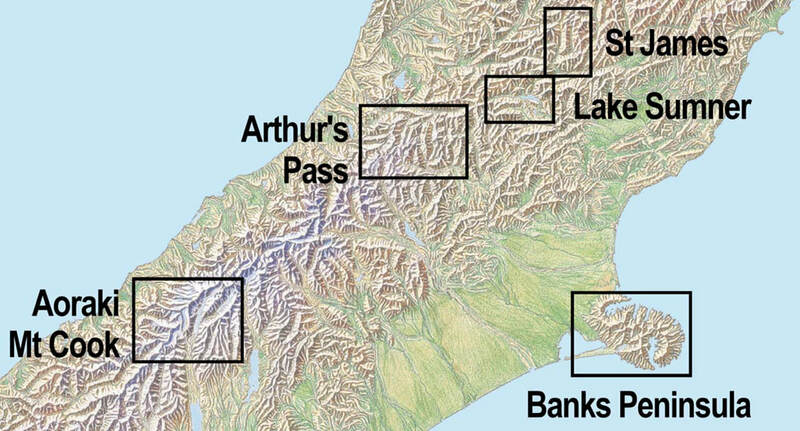 Most of the Lewis Pass National Reserve is on the western edge. Large format 600x840mm (approx. A1). Folded to 120x210mm.